Each week throughout the summer we’ll hear from a designer about a pattern or book that caused them to head in a new direction and helped form their career. This is the eighth post in the series. You can read all of them right here. 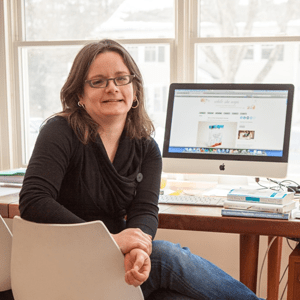 Melissa Quaal is a self-taught sewist, pattern designer and sewing instructor originally from the woods of Northern Minnesota and currently living in Central New Jersey. She went to graduate school in public policy research and anti-poverty studies before answering the long-ignored call to make all the things. Now she balances parenting two wild, nature-loving boys with teaching sewing classes and sewing something every day. Catch up with Melissa on her blog, A Happy Stitch. I love this video about Melissa. You really get a sense of who she is and her devotion to teaching others to sew. 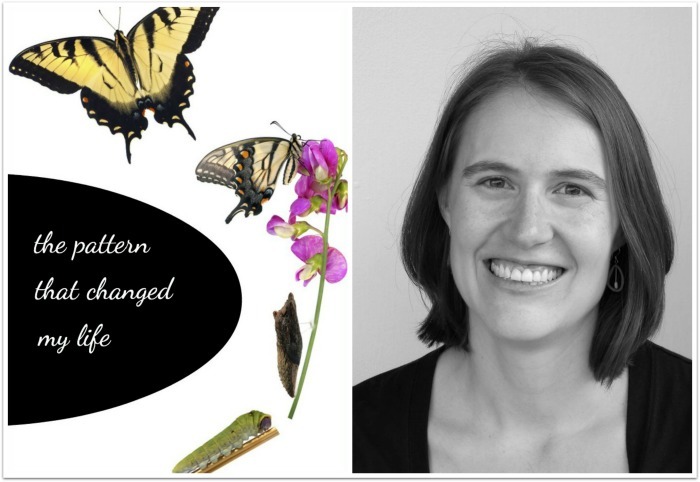 The book that changed Melissa’s life is one that I love as well. I’m so pleased to share Melissa’s story with you. 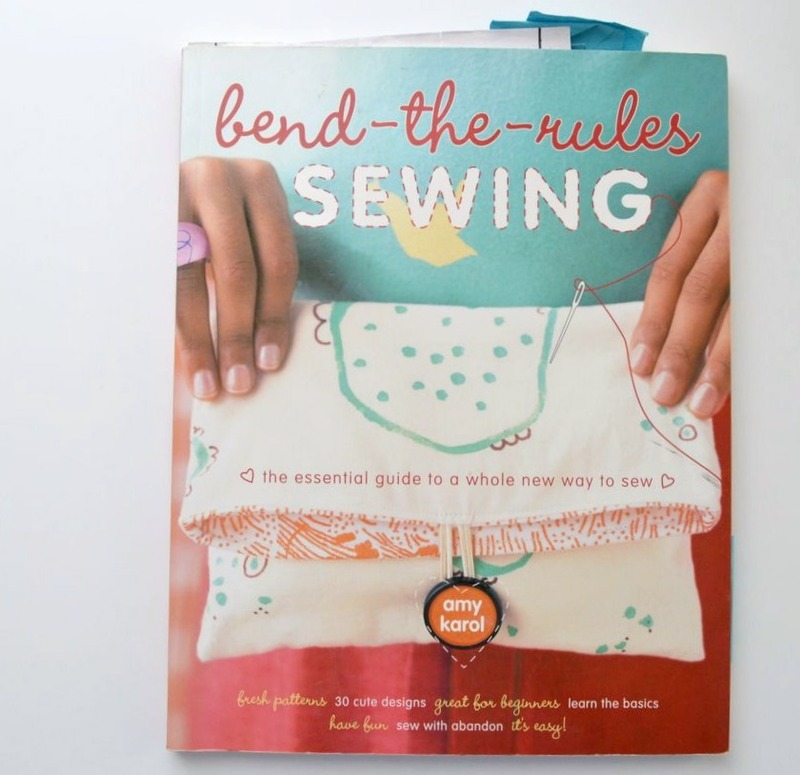 The book that changed my life is Bend-the-Rules Sewing by Amy Karol. I consider Amy the goddess guiding my sewing career. Before discovering her book I had a very dismissive opinion of myself as a sewist. I was sewing a lot and giving handmade gifts but wasn’t a specialist in any one thing. As soon as I mastered one thing I wanted to make something new, try a different technique. I considered myself ‘impatient’ and ‘distracted’; unable to ‘get serious’ about sewing. One of the projects in Bend-the-Rules Sewing by Amy Karol. I grew up surrounded by women who could seriously sew. My mother used to sew elaborate Easter dresses for my sister and I and my grandmother had a closet full of handmade fully lined wool pantsuits. My great-grandmother was a designer and seamstress at the Pendleton Wool Company in Nebraska. Sewing was everywhere. Yet, everyone around me operated with more of a perfectionist bent than what my frenetic energy seemed to allow. 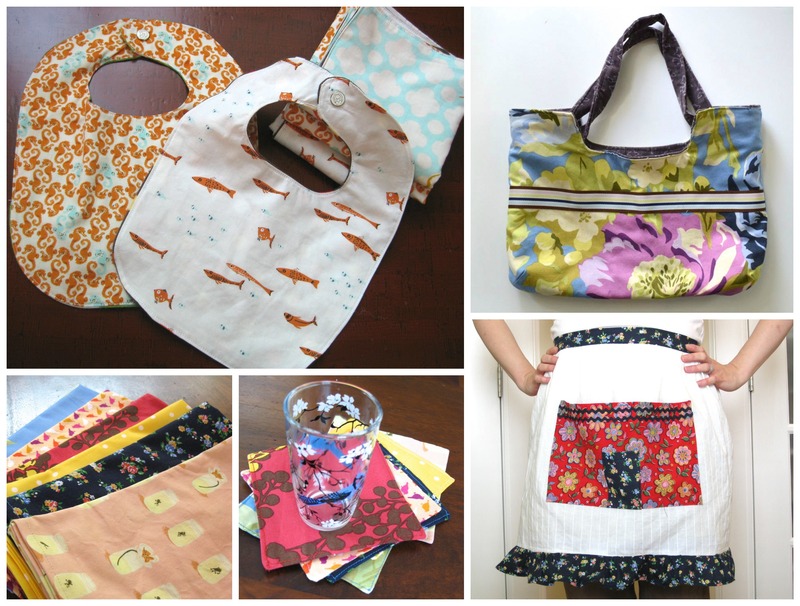 Some of the projects Melissa made from Bend-the-Rules Sewing by Amy Karol. Where I wanted to explore and wing it, I got the message that ‘real sewists’ obviously specialize. People were quilters with a capital Q meaning they had perfected their quarter inch seams and stood at level Expert in color theory. If you didn’t know how to get the perfect fit on a dress, you just shouldn’t even make one. It just seemed that every time I tried to follow all the rules and do things the right way it drained all of the joy out of it for me. As a result, I resigned myself to being little more than a hobby sewist and there were long stretches when I didn’t sew at all. Looking back, it amazes me what a big impact such tiny discouragements had. Fortunately, the same can be said of words of encouragement because along came Amy and her crazy, liberating Bend-The-Rules philosophy. Right there in the book was every message I needed to hear. 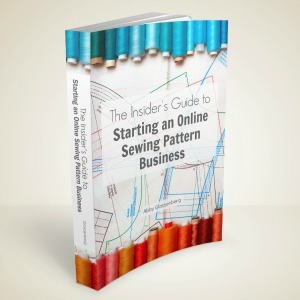 She not only lays out, in plain language, what the most basic sewing terms mean but she also had a section called “What Kind of Crafter Are You?” in which she lays out different approaches to sewing. There I was, according to Amy, “The Artist”. Not “The Impatient One” or “The Lazy One” or “The Scattered One” but the artist. Possibly the word I’m most scared of. And, her advice? I was sold. I decided to do exactly as she told me. I ended up completing twenty of the thirty projects in the book and following the instructions, to the letter, for each one. It was as if I had taken an entire college course. Not only did my skill level increase exponentially but so did my confidence. I learned how to properly bind a quilt, sew an invisible stitch, make stuffed animals, hem effectively and so much more. 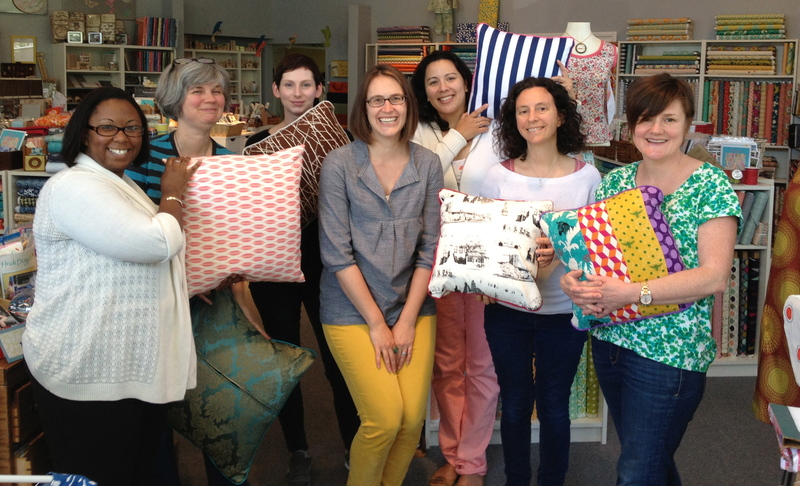 Melissa’s sewing students show off their finished projects. 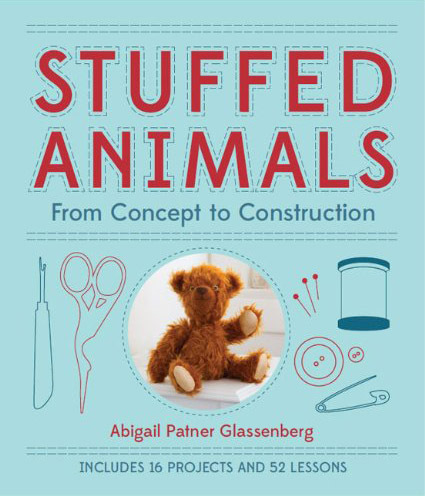 Because of everything I learned in Amy’s book I became less shy and apologetic about giving handmade gifts and soon enough people at work were asking me to teach them to sew. 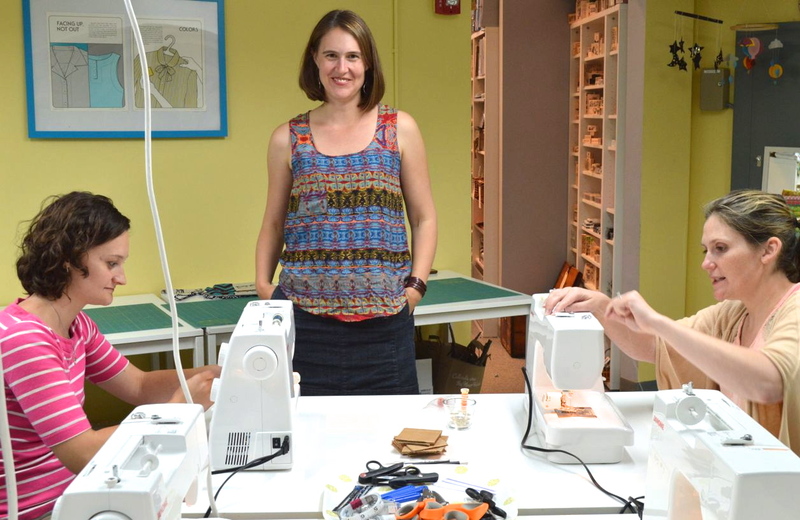 I started giving sewing lessons during our lunch break and with the encouragement of my coworkers I eventually left my stifling non-profit job and started teaching sewing for a living. Turns out, I love teaching people to sew. Through the projects in Amy’s book, some experimentation and other patterns, I learned how to strike a very important balance. There are, in fact, times when following patterns exactly is important but it doesn’t mean you never get to let loose and be creative, trying it out your way. I found this sweet spot where I knew enough to strike out on my own. I could satisfy my desire to explore and attempt something new but in a more constructive and satisfying way. I started to get a feel for when I had learned enough to wing it with some chance at success. Perhaps even more important than that, I became aware of the different goals and learning processes of all sewists. There is no one way to be a sewist. 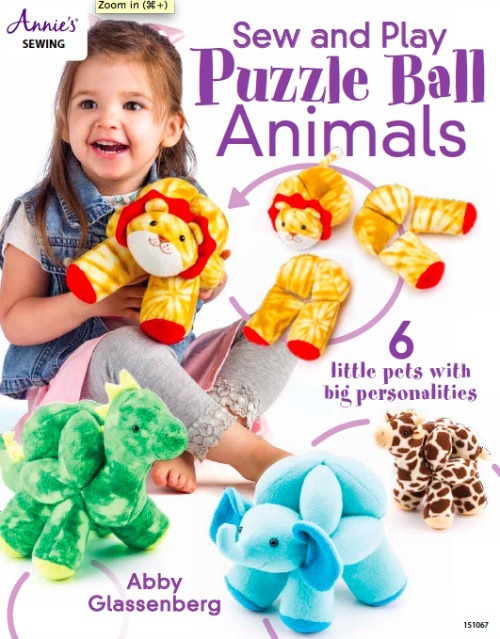 Sewing and making things casts a wide net and it catches all kinds of people, all of whom bring their own, beautiful opportunities and snaggle-toothed challenges to the table. We all just long to make things for ourselves. Everyone is coming from a different place with different purposes but after years of teaching I can see sewing meets different need for different people. Maybe it’s the satisfaction of lining something up perfectly or the ability to let go of outside-life perfectionism. Perhaps it’s the excitement that comes from whizzing through a project or realizing that you can take a single technique in a million different directions. Regardless, sewing can be a place where we uncover, make peace with and find ourselves. 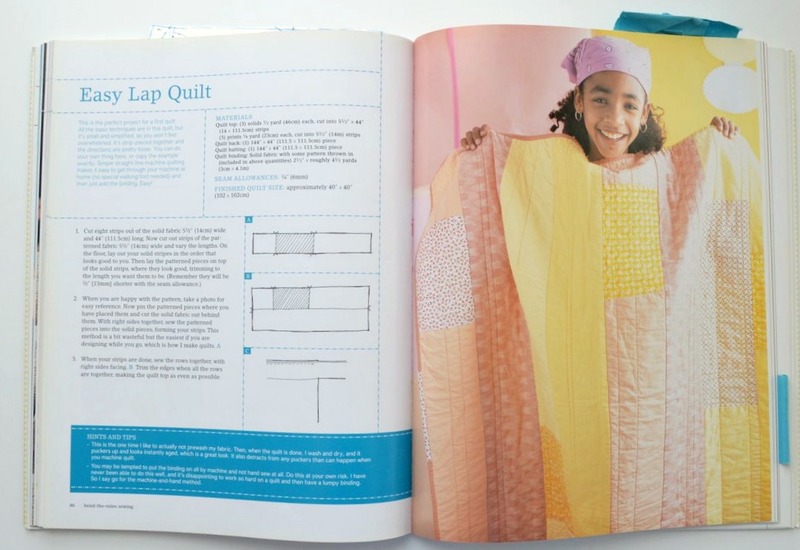 Bend-the-Rules Sewing by Amy Karol is the book that changed Melissa Quaal’s life. Is there a book that changed your? P.S. Next week is the last week of this summer-long series. It’s been really amazing to hear these transformation stories from so many designers and avid sewists. For me the theme that runs through every one is a longing to be creative and to not be perfect. More analysis next week, but that one theme does stand out clearly to me. How inspiring! 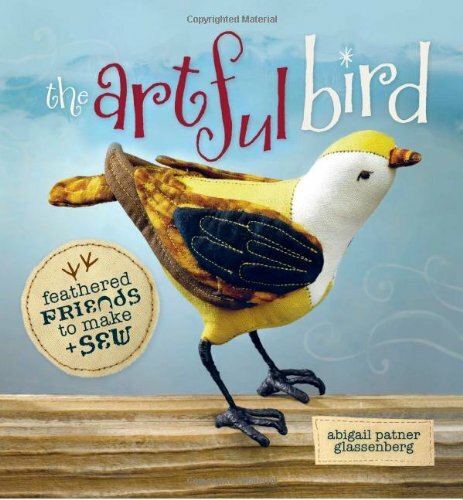 I just ordered this book and can’t wait to try it! It’s super good. When each of my older daughters began first grade and started getting an allowance for the first time I made them wallets from Bend-the-Rules Sewing. Simple, straightforward and fun to make without any intimidation. Love it! Wow! I have goosebumps – this has so resonated with me. For years I couldnt sew because of the tension I would get and immediate headache because whatever I sewed had to be done in a certain way and perfect from the beginning. I would get all enthusiastic about a project, buy the fabric etc and give up. And this is after years of dressmaking, making everything for myself and my children, I just couldnt sew any more. I slowly have been able to make things again and be pleased with them because I made them. I havent got back to dressmaking, but I am closer. Thank you. I’m so glad that Melissa’s story resonated with you, Hilary! It did with me, too. What is it about sewing and perfection? The two are so often coupled in a debilitating way. I love that Amy’s book encourages you to just jump in and get going with making things. I get where Melissa is coming from. I try to hold onto the joy of spontaneous crafting, while owning to having just a bit of pedantry or perfectionism in how I like things done. The overly keen person who insists on everything being ‘correct’ whatever that is (something determined very early on and perhaps in the first how to book they owned), can kill off all the creativity. Now I know that really there are no rules unless you want there to be. I’ve read so often of people going to art school and suffering criticisms which killed off their art because it wasn’t good enough. So as I get older I cheer for just getting on and doing, rather than worry too much about how you are doing it. Fear of doing it ‘wrong’ stops people from ever starting. Sewing is funny because you have the creative sewers and the neat sewers and sometimes they come together but sometimes you have to choose and so then I’ll go for creativity and individuality every time. On the other hand I do admire a nice neat little stitch! I’ve just watched two free art classes on video. One filled me with impatience to get started my mind filled with new things to draw, and the other I had to switch off – the man mentioned geometry 3 times in less than five minutes while painting a flower. The attitude translated to the end art. One I’m afraid I just switched off from. I have also noticed that sometimes talented parents can be off putting to their children ever getting started as they give across the message that they are just not ‘good enough’. I am really excited to read this. Now. After it was posted so long ago! I feel exactly like you did. So I think I am going to ask for this book for Christmas.